Not only can you be a "Facebook Assassin" with Assassin's Creed: Project Legacy, but playing it will unlock items and landmarks in your console game. 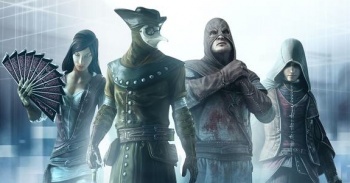 According to information released by Ubisoft at a press event in San Francisco, you can create a unique assassin profile in Assassin's Creed: Project Legacy. Your assassin can specialize in any number of disciplines, such as political intrigue or skulking around in shadow. Progression through Legacy will be somewhat linear, with quest rewards needed to unlock even more quests. As you level up, Ubisoft said that you will need more complex items under your control, such as a certain number of soldiers or horses. Legacy launches on Facebook today, but it does not seem to be live yet. Ubisoft's Chris Early called such interaction "a virtuous cycle," but I was thinking of a different "V" word. I personally have never had very much fun with these kind of Facebook games or "Snore-PGs" as one developer termed them, but I don't think that I am the target audience for Ubisoft's Companion Gaming initiative. To read more about Ubisoft's plans for more social gaming in the future, check out Steve Butts' report from the press event in San Francisco.